I’m a Realtor who sells homes in Lake Oswego so you could say I have a biased viewpoint about this town I live and work in. This week I decided to defer to some out-of-town visitors and let you see Lake Oswego through their eyes. ●Leslie Kramer, San Francisco Bay Area: Coming to Lake Oswego on vacation is like a chunk of heaven! With its beautiful surroundings and warm welcome, any pressures of day to day life seem to evaporate when we arrive. Being from a small New England town – where the community is close knit and supportive – makes Lake Oswego feel like being home again! ●Jeremy Logan, Southern California: I was blessed with an opportunity to visit Lake Oswego for a three day weekend this summer. Every person I met was super friendly and even though it was my first time there it felt like home. The lake was beautiful and if you need a relaxing weekend away from your everyday life I couldn’t recommend a better place than LO. My friends and I had so much fun we are going to make this an annual trip. We’ve done a ton of fun things this summer but the weekend in LO may be one of the highlights! ●Corey Van Houten, San Francisco Bay Area: My first trip to Oregon was a visit to Lake Oswego. The warm people, the picturesque lake setting, and the relaxed atmosphere made it a place I never wanted to leave. Lake Oswego truly has it all, and I hope to be back soon! ●Georgette Milla, San Joaquin Valley in California: We so enjoy our visits to Lake Oswego. It is a quaint town, love the hanging baskets with bright flowers and love the small-town feel. Walking through the town was so delightful and seeing so many sculptures displayed felt like we were walking through an art gallery. The lake is absolutely beautiful and beckons you to cruise its waters and take in the architectural delights. ●Betty Cavallero, San Francisco Bay Area: We have had many friends and neighbors move up to Lake Oswego over the years. Frankly, we couldn’t figure out why since we think we have it pretty good here in the Bay Area! We made our first trip to Lake Oswego when our daughter had her wedding shower at her future-in-laws’ home. We were struck with how green everything was and the surrounding beauty. My husband’s college roommate took us around the lake and we marveled at the homes we saw. The people we met were so friendly and welcoming. It felt like a close knit community and had a “small” town feel to it. We have returned for visits and always enjoy our time spent there. Maybe our friends have found something special in Lake Oswego! 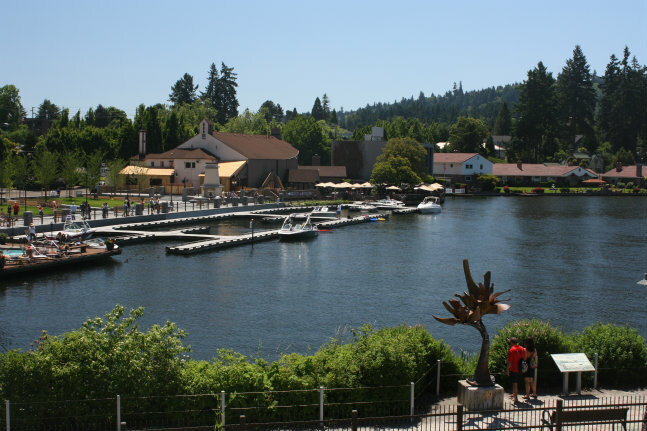 Find out more reasons to love Lake Oswego. Subscribe to this blog by clicking the “Sign me up” button in the top right hand column. This entry was posted in Lake Oswego lifestyle and tagged Lake Oswego Oregon. Bookmark the permalink.